I'd love to win, everyone in the house has either an ipod nano or a touch..I'd just like a little Shuffle so I could listen to my music. I would love to win an ipod Shuffle! Thanks for the chance! I have never used an iPod so this would be great for me. waving my hands here!, yep count me in. I would love one of these! I have heard that these are great for working out! Thanks! Great Prize! Thanks so much for offering this giveaway. Great Christmas present for my nephew since Im poor! I would love to win--this would be great to take to the gym! Fantastic giveaway, thank you for hosting! That is a beauty! Thanks for the chance! These are so great. I use mine at the gym every day I go. They're virtually indestructable and so small and lightweight. What a great giveaway - everyone in my family loves music - including my little two year old. I would love to be i on this! It just seems too easy...not that I'm complaining! I would love to win this for my granddaughter. She's been wanting an mp3 player but due to her age, we don't want to invest in something too expensive, thanks. I've always wanted one. Thanks for the opportunity. I'd love to win a Shuffle -- it's so convenient for listening to your favorite music :) *Thanks* for the giveaway! I'd love to win this for my daughter! thanks so much for the entry! my walks and while cleaning the house. Please enter my name in your fabulous prize drawing. I've never owned a shuffle; I'd like one! Thanks for the fantastic giveaway! Happy Sunday! I would love to win this for my niece...her favorite color is Blue, so she would love this one! Ooh I would love to win this! Blue is my favorite color, and this new mp3 player would be so much fun to use. Thanks!! Please enter me~I would love to win this! would love to win! today's entry! This would be great to have when I'm jogging! I would love a chance at this. Thanks! I would love to win one. Thanks. 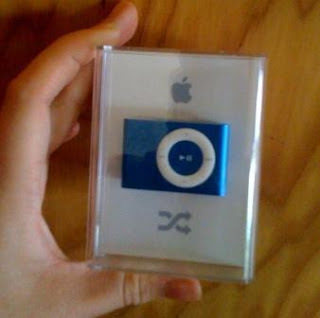 My son would be a happy camper if I won him a blue ipod shuffle! Wow - that's really tiny! It looks so different from my first one! Would love to win this shuffle. Love the color too! Thanks so much. I would love to win this... I still haven't ever owned a MP3 player yet!!! i need one for the gym. I'd like to win. Love the color! I want to win please sign me up. Thank you. I've always wanted one of these to exercise with. Those are so cute and I love the blue color! I want to win this for my sister. She told me the other day she wanted one. Definetly would be great to win! Thanks for offering this wonderful prize. This would be great for my walks. Thanks! I appreciate not having to jump through hoops every now and then! thanks! This is my entry for today! Oh! Let me win it. Nice! Thanks for keeping it simple to enter. I'd love to win this for my 11 yoa son. Thanks. I can't believe how small they've gotten. I'd love to win this! This is what my daughter wants for Christmas, so this would be a most welcome win! wow! winning this would be awesome! I'd love to win ! Thanks! Would love to win. Thanks for offering this giveaway. I just commented and didn't leave my email! I hope I win! I'd love this for my walks. Thank you. Thanks for a fun giveaway..I'd love to win this! Fun giveaway, thanks for the chance! I would really love to win this. Love the color too. Thanks. Daily comment in hopes of winning! I hope you are having a wonderful day. Thanks for the giveaway! I love this blue mp3 player! I really love this prize! My daughter just fell and cracked the fast forward button on her MP3 player, so if I won, I'd give it to her instead of keeping it for myself like I would like! Love the color and love how tiny it is! Thanks for such awesome giveaway. Yep I would love to win this! A shuffle would be awesome! thanks for the chance to win! great prize! My son just put his MP3 player through the wash - grrr!! I want to win! Thanks for making it easy and fair! I would love to win a Shuffle! Would love to win this great-looking iPod shuffle! I would love an ipod Shuffle! I have a daughter with a broken fast forward button and a son who put his MP3 player through the wash! I need this! I'd love to win! My younger son desperately wants an MP3 player just like his older brother. I would love to have an ipod. Thanks for the giveaway! I'm back for another entry - thanks again for a great giveaway! 9/20 I would love to win! I really really want to win! It would give me some incentive to work out! Great Prize~I would love to win! That's so cute! I'd love to win! This would be an awesome to have!